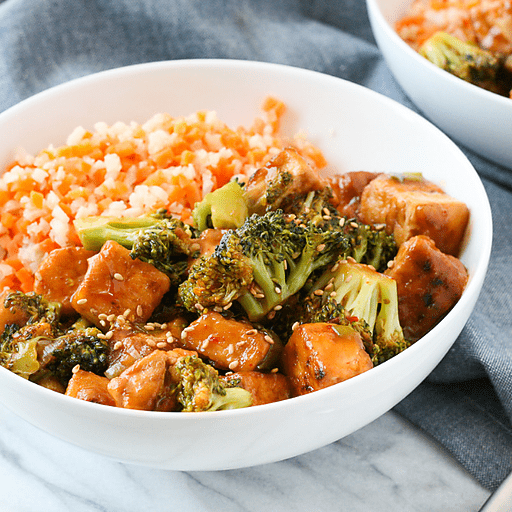 We've taken a Chinese takeout favorite and remade it with a plant-based protein - tofu! We love using tofu because it's the perfect blank slate for delicious sauce. This easy, flavorful General Tso's Tofu is lighter than the deep-fried version and comes together in just minutes. 1. Remove tofu from packaging and place on a plate with paper towels. Cover tofu with more paper towels and place a heavy skillet on top to press. Let sit for 10 minutes. 1. Cut pressed tofu into ¾-inch cubes and place into a shallow bowl. Top with 2 Tbsp. soy sauce, 1 Tbsp. maple syrup and 1 tsp. chili garlic sauce and gently stir to combine. Let rest for 3-5 minutes, stirring occasionally. 1. While tofu is marinating, prepare the sauce. In a small bowl, whisk together stock, garlic, ginger, rice vinegar, sherry, 2 Tbsp. soy sauce, ¼ cup maple syrup, 1 tsp. sesame oil and 1 tsp. cornstarch until smooth. Set aside. 1. Transfer marinated tofu into a large zip-top bag. Add remaining ⅓ cup cornstarch 1 Tbsp. at a time and toss to coat. Continue to add cornstarch and toss to coat until tofu is evenly coated in a white layer. 1. Heat 1 Tbsp. vegetable oil in a large skillet over medium heat. 1. Use a slotted spoon to add tofu to the skillet, making sure to shake off excess cornstarch. Cook tofu on all sides for 1-2 minutes, or until golden brown. Once cooked, remove from pan and set aside. 1. Return skillet to burner and increase heat to medium-high. Add 1 Tbsp. sesame oil and allow to warm. Add chopped broccoli and sauté for 2 minutes, or until tender-crisp. Add green onions and remaining 1 Tbsp. chili sauce and sauté for an additional 1-2 minutes, stirring frequently. 1. Add the tofu and sauce and stir to combine. Cook for 1-2 minutes, or until warmed through and sauce is slightly thickened. 1. Serve tofu and vegetables with rice and garnish with sesame seeds, if desired. Serve with steamed brown rice instead of rice vegetables for a whole-grain boost. Calories 340, Total Fat 12g (Saturated 2g, Trans 0g), Cholesterol 0mg, Sodium 810mg, Total Carbohydrate 45g (Dietary Fiber 4g, Total Sugars 21g, Includes 15g Added Sugars), Protein 16g, Vitamin D 0%, Calcium 20%, Iron 20%, Potassium 15% *Nutritional values are an approximation. Actual nutritional values may vary due to preparation techniques, variations related to suppliers, regional and seasonal differences, or rounding.